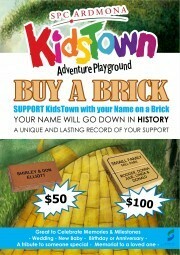 HELP us Grow KidsTown for your Children to grow and enjoy this amazing playground for years to come...!!!! A brick or paver costs $50.00 this entitles you to have your name engraved into a paver as a lasting record of your valued support. If you have memories or a milestone, celebrating a wedding, new baby, birthday or anniversary or a tribute to someone special or a memorial to a loved one, why not get their name engraved into a double paver for a unique and lasting record. Cost of the unique opportunity is $100.00.